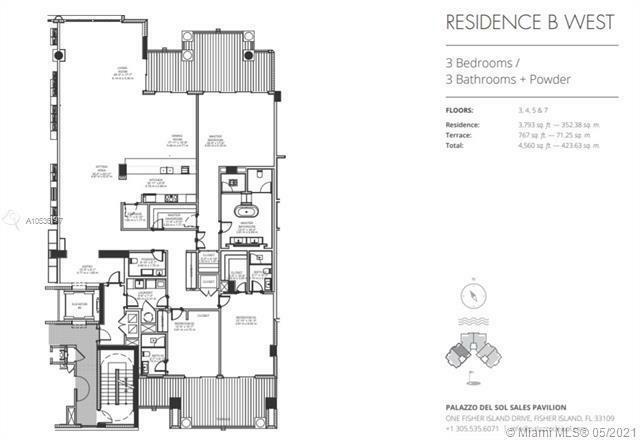 TURNKEY 3 BEDROOM CASUAL ISLAND RETREAT FULLY FURNISHED BY ARTEFACTO!!! Professionally Designed In a Relaxed Contemporary Style w/Soft Color Palette & Natural Accents. Spacious 3,793sf Floor-Through plan w/picture perfect Water & City Views including Government Cut, SoBe & Miami Beach Marina. Wide-plank European Oak Wood Flooring throughout, Private Elevator entry, 10 floor to ceiling glass, Lualdi doors, Nest thermostat, Boffi Kitchen w/Gaggenau & SubZero appliances, Boffi Master Bath w/BookMatched Statuaria Marble & custom tub. 2 Parking Spaces. Garia Golf Cart. Building Amenities: Butler-Serviced Aperitivo Bar & Lounge, Theatre, Salon, Massage Rooms, Business Center, Gym + Cardio, kids Playroom, Concierge, Valet, Enzo Enea Pool Terrace w/Zero-Edge Pool & Spa + Attendant. The data relating to real estate for sale on this web site comes in part from the participating Associations of the Miami Multiple Listing Service. The MLS data provided for the property above (A10536197) is provided courtesy of (Fisher Island Real Estate, LLC). The information being provided is for consumers' personal, non-commercial use and may not be used for any purpose other than to identify prospective properties consumers may be interested in purchasing. Information is deemed reliable but not guaranteed. Data last updated on 04-21-2019.